This algorithm, the "Adam", combines the effects of the "Gordon" and "SourceFilesArray" algorithms discussed in posts 0006 and 0007. 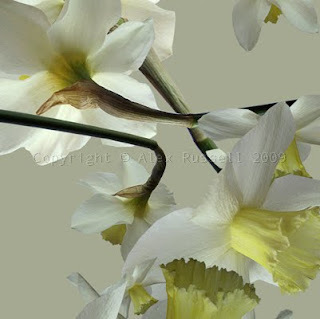 The code was pointed at a folder of daffodil photos, all previously removed from their backgrounds. From an aethetic point of view, although I like the large scale of the imagery, the next step is to tweak the code to get it smaller and thus evoke the sateen repeat effect.